I had a super busy week last week with work and life stuff. This week should be better and I'm really looking forward to Easter weekend. I finished up I10 tonight. At first it was a frightening combination of paper/foundation piecing and applique - I was brave and it turned out great. My quilt guild is having a show in May and I really want to put something in. 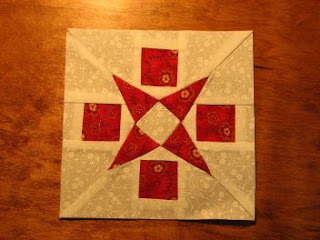 I'm going to take a stab at finishing the red and white Hunter's Star. This weekend will be the deciding factor in timing I think. p.s. I'm hooking up to Patchworktimes for Design Wall Monday. I love this block. You did a great job. BTW, gook luck in your endeavors!! Your block turned out beautifully. Some of those blocks can be a real bear. I think you did great.